Last week, one of the first streaming services to allow video creators a pay to play option on their website announced a change of service. 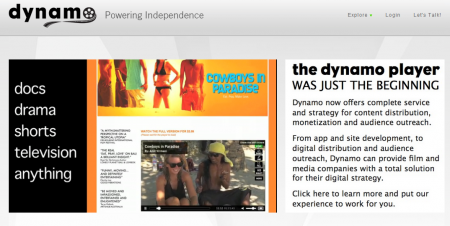 Dynamo Player has been around for about 3 years, but as many more services now populate the digital video pay to stream space, Dynamo saw a need to adjust their offerings and enable more than just a video player. Founder Rob Millis talked to me about the changes due to take effect in January 2013. Explain how Dynamo is changing into a White Label Service? Dynamo will be white label meaning that any company, distributor or filmmaker can put their own branding and customized options onto our digital platform. You’ll be able to use the Dynamo infrastructure and technology under your own brand without sharing revenue with us and without having our management involved unless you want it involved. It has been in demand from our most professional users for a while so we’re making these changes in order to serve them and make the service more tailored. In January, we will be announcing pricing and the full offering. In general, Dynamo has been in the background of the user experience except during the purchase process where users go to the Dynamo website and the Dynamo payment process. With the white label option, the user has an entirely consistent process through the artist’s brand. A recent example is a very popular rock band who wanted every aspect to be under their name with their branding completely integrated into the whole buying experience. We couldn’t offer this before, but now we can. Before, artists could use the Dynamo Player dashboard to see payments, see orders, collect emails etc. Does this now mean that they have to source everything independently and connect it to the player? No, not at all. Dynamo can still do everything it always could, but now it will be accessed on a flat fee basis rather than through a revenue share we had before. But now you have an option to license the system for your own use. And that would probably be more suited to enterprise level clients who have lots of films they are selling rather than a filmmaker with one film? Yes, but we are also moving to offer more distribution options than just the player. We are aiming to be more of a one stop shop working with other platforms. In the past, we may have been seen as competing with other services, but we don’t see any reason to continue that if we can serve clients better by helping them get to more platforms that we are usually more familiar with and have more experience with than the filmmakers. For example, if I want my film on iTunes, now Dynamo can manage that process for me? Do all the encoding and the QC that Apple needs to make my film available in iTunes? Yes, we can either advise and consult and you take care of the technical aspects yourself or we can manage the whole process via a third party. We are looking to become an aggregator with a direct relationship with iTunes. And that is flat fee based, no revenue share from the iTunes revenue? And what about the app building, that isn’t something Dynamo was doing before? It is new. We have experience with it, but we weren’t offering it to filmmakers before. This is our effort to be a one stop shop for marketing and distribution of content. Often filmmakers and even medium size media companies don’t know what questions to ask when they hire development team to build an application. There is a real need to have consultation between producers and technical developers when building an app. We think most app products on the market are grossly overpriced and we can either consult to help negotiate better pricing or to take some of this work inhouse to be more economical. What precipitated this change? In the 3 years since Dynamo Player existed as one of the first paid video streaming services available, what has changed in the market? In a lot of ways, we were more necessary for the long tail of film sales a few years ago and we have felt a responsibility to support long tail sales for filmmakers. But now we are seeing more of a call for customization of the player, reaching other digital platforms as well, assisting with website design and development, as well as providing technical support that filmmakers are not comfortable with and we aren’t seeing many service providers in the film space who are able to offer that. For our professional users who are seeing a lot of customer demand, we want to be able to support them through those services. I would imagine as well that there are many films using your service purely as a repository, somewhere to keep their films online even when they aren’t working the titles with any marketing support. In a revenue share scenario, they are costing Dynamo more money to host them than they will ever sell. Is this also a factor in a change to flat fee, contract work rather than revenue share? The cost of supporting many users who are either not supporting their own content with marketing or using Dynamo as a storage service has been a problem over time. It isn’t prohibitively expensive from a bandwidth point of view, but it is distracting when running a business because it keeps us from being able to service our clients who are working hard to get their films seen. However, we will keep the system open for all of our current clients with a dramatic discount going forward, even if they have zero sales because, for many, it is really important that the film be available online and that they are able to maintain a consistent presence on the web regardless of whether they get one sale or a thousand sales a month. We don’t want to kick any of those users off of the system. We will have a pricing model for those who want to use the Dynamo Player platform, but don’t expect huge sales. They will still be able to access via a flat fee. I was reading in another publication that you overestimated how fast Hollywood would move to innovate in the digital space. I can see how difficult it is for large corporations to innovate in a hurry, but I am still surprised in looking at the films coming into Sundance now that are still getting sales agents to negotiate traditional deals, even digital deals, and not putting up their own websites. Does it surprise you that independent filmmakers are also not very innovative? It never occurred to me before I started Dynamo the differences between a web producer and a filmmaker. The differences between what is gratifying for each. For someone who is used to working on serial content for the web, they are used to building their own website, they are used to working Facebook and Twitter almost in their sleep, they are excited to have more eyeballs than big fame and more buzz than expensive contracts. Filmmakers get more gratification from seeing their work on a big screen. It is a very different kind of production, a very different kind of audience, and there is less cross over between those 2 worlds than I ever expected. In a lot of ways, no matter what’s possible for a feature film to be distributed, filmmakers always wish that their film will fill a theater and show on a big screen and if it means waiting for 6 months to find a company that will make that a reality, it is a very tempting gamble for a filmmaker to take. On the other hand, it is an industry filled with people who are inclined to be incredibly creative with sound, camera gear, and editing technique. They have stronger acting backgrounds informing their work. There has been less emphasis on distribution of the work because that has always been handled by other people. Directors and producers have a much more creative emphasis than to be social media and digital innovators. Are there plans with Dynamo to output to some services like Roku, Apple TV, Xbox etc.? Certainly for particular clients who are interested in this, we will. There is definitely some content that should go out through Roku and Boxee etc, but some content creators shouldn’t waste their time or money. How about if distributors with a slate of films want to access these set top boxes to get their films into the home? Can Dynamo help with that? Absolutely, especially for distributors and small studios that have a collection of titles that sit under one brand. It would be valuable to have a presence on these platforms with all of their titles available on the set top boxes. It is a matter of scale for them really, to consistently deliver new titles under one brand. While it is still very early in the history of smart TVs and set top boxes, we are starting to see an uptick in the click through rates of households watching content available on these services. For a single program or film to get attention there, it probably isn’t worth the investment, but for a company with many titles, absolutely it is and we are happy to help with that. I thank Rob for taking the time to explain the changes at Dynamo and I hope this helps to clarify things for those who are currently using the service and for those who are contemplating a service for digital distribution. If you found this article useful, tweet about it HERE.